We caught up with Myro, illustrator and champion of window art who originally started out at Village Greens, a community shop in Prestwich, Greater Manchester. She shares why doodling on your windows is a trick not to miss for community businesses. Myro will also be delivering a professional window illustration session with the winner of our #CBwindows competition for community businesses opening their doors for Community Business Weekend. Carry on reading to get Myro’s top 5 tips. Why would you recommend window art for community businesses? Windows are an underused part of a business but they are gold dust. At Village Greens, people stop, read, come in and soon enough they become customers. Those who didn’t know what we did might have felt intimidated about coming in but the window art was our friendly introduction. For community businesses the benefits are endless. You can be pretty sure you’ll be the only shop with handrawn window art, which makes yours special. Also window pens cost next to nothing, you might even get one free if you are taking part in Community Business Weekend. I would spend up to £10/month on window pens and this would be a low-cost way of grabbing people’s attention. I would recommend changing it regularly too, ahead of big events or festivities like Christmas, Halloween etc. but it doesn’t have to be the Sistine Chapel. Make it simple and easy to achieve. If you don’t like drawings use text, plus you can always wipe it off and start again. So, how did your love for illustration and window art begin? I have no qualifications in art, just a normal degree and normal jobs up until starting my business, but throughout my life I have always drawn, ever since I was a kid I just couldn’t keep pens away from paper. 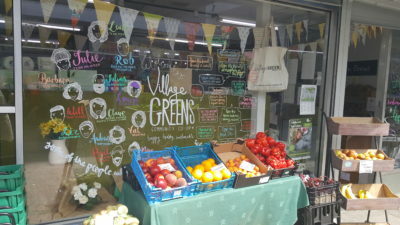 We hear Village Greens was where the window art began, but how did you get involved in community business? That’s what I love about community businesses, whatever your skill is they find a role for you and in my case left me completely to it. Admittedly, the first window was minimal but I managed to work on it and tell the story of all the Staff/Volunteers/Board members. One of my favourite designs at the shop was drawing a variety of different squashes that we sold, each with tips on how to cook it. What’s your top tips for using window pens? If you don’t you’ll never start. Don’t be timid, make the most of the space and make it a real feature of your window. Don’t worry about planning it all out and measuring every inch, make a mess, have fun and if it doesn’t turn out how you imagined, wipe it off and start again. That’s the beauty of window pens. When I’m creating window art with text, I like to see how much I can take in while walking by the shop without stopping. That’s the perfect amount of information. Use snappy sentences that let people know something about your community business, i.e. “We’re all the boss”. Also think about special offers or event details. What is the key information you want people to remember/that will attract their attention. Sounds tricky but if you write on the outside window roughly, then use that as a guide to write on the reverse and wipe off the guide writing when you’re done – it’s much easier! There’s plenty of online resources to help you get ideas. Pinterest is a good one, and a little birdie told me, Community Business Weekend’s Pinterest has a good selection of ideas. There’s also various videos for fonts and scripts. Your confidence will grow! Plus, Community Business Weekend 2017 is a great opportunity to live out your wildest dreams for a window display. Want to enter our competition? Look out for our #CBwindows competition, launching on September 1 and win yourself a professional window art session with Myro, you need to first register to take part in Community Business Weekend and receive you free window pen. If you’ve already registered, read more about the competition rules. Use our interactive map to discover which community businesses are near you, and which are taking part in Community Business Weekend. 9 tips, gleaned from community businesses themselves, to get yourself on the map.